This definition also extends to rapid restoration of normal perfusion pressure, for example, with thrombolytic therapy for acute ischemic stroke. Reperfusion syndrome can occur as a complication of carotid endarterectomy (CEA), intracranial stenting, and even bland cerebral infarction. When patients are identified and treated early, the prognosis is better and the incidence of intracranial hemorrhage is decreased. Outcomes are dependent on timely recognition and prevention of precipitating factors. Most important is the treatment of hypertension before it can inflict damage in the form of edema or hemorrhage. Studies indicate that reperfusion injury is involved directly in the potentiation of stroke damage. Components of the inflammatory response, including cytokine release and leukocyte adhesion, appear to play key roles in these deleterious effects. Damage to the blood-brain barrier (BBB), an important factor in reperfusion injury, is seen in the image below. 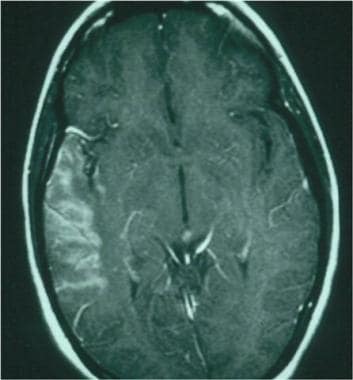 Postcontrast image 24 hours after a right middle cerebral artery stroke, demonstrating contrast extravasation through a faulty blood-brain barrier. Headache is the most common symptom (62%). Typically, patients display migrainous features with severe, ipsilateral, pounding headache. Elevated blood pressure is the most common factor found in symptomatic patients. [8, 10, 11] During acute ischemic stroke, systemic blood pressure often rises as a physiologic compensation for cerebral ischemia. As a rule, elevated blood pressure is not treated, so as not to compromise flow to the tenuous penumbra. The key to reperfusion injury in this scenario is ischemic disruption of the blood-brain barrier (BBB). The offended BBB contains abnormally permeable ischemic capillaries. 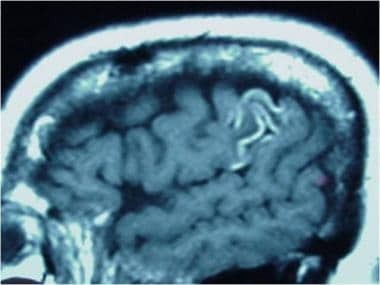 T1 sagittal image without contrast demonstrating gyriform hyperintensities. These represent subacute petechial hemorrhage around an area of subacute infarction secondary to uncontrolled hypertension. Ischemia-reperfusion injury is characterized by oxidant production, complement activation, and increased microvascular permeability. Various cytokines peak in the serum within the first 24 hours of an acute stroke and are thought to initiate the cascade of tissue damage. At the site of ischemia itself, activated leukocytes release free radicals and toxins, causing further destruction. The combination results in an impaired BBB, which can lead to cerebral edema and/or hemorrhage. These changes are especially important in the setting of hypertension, as indicated above. In the setting of revascularization, the fundamental question is whether the increased rates of hemorrhagic transformation are caused by reperfusion and the biochemical pathways, or if they are specific consequences of the lytic state itself. Hemorrhagic transformation is now known to be a multifactorial process. Stroke severity is likely to be a major predictor of symptomatic intracerebral hemorrhage because it is associated with the volume of ischemic brain at risk for hemorrhagic transformation. Older patients may be at greater risk of symptomatic intracerebral hemorrhage. Higher lytic doses are associated with higher symptomatic intracerebral hemorrhage risk, but whether lower doses can achieve adequate benefit with less risk is not known. Delayed revascularization minimizes benefit and likely increases risk. The goal of acute revascularization should not just be to open occluded vessels but to open them quickly. Patient selection based on physiologic parameters is likely important to reduce late hemorrhage attributable to revascularization. Evolving acute ischemic strokes resulting from proximal cerebral artery occlusions often result in large areas of penumbra that are likely vulnerable to reperfusion injury following revascularization. Longer periods of hypoperfusion to these areas, incurred as the therapeutic treatment window has extended beyond 6 hours in patients with favorable perfusion imaging (see image below), could possibly result in increased susceptibility of recoverable tissue to additional injury. It currently remains unclear to what extent reperfusion injury might contribute to loss of penumbra following mechanical thrombectomy. Further research in this area could have the potential to improve post-thrombectomy outcomes through its prevention and treatment. Two studies have demonstrated that higher blood pressure goals following thrombectomy, traditionally thought to be beneficial in acute stroke by promoting perfusion of the penumbra, correlated with worse clinical outcomes. [31, 32] It is possible that these findings are in part due to the negative effects of reperfusion injury. Neuroprotective agents, whose previous failures in clinical trials could have resulted from insufficient delivery to tissues at risk for irreversible injury behind occluded vessels, might also deserve a second look. 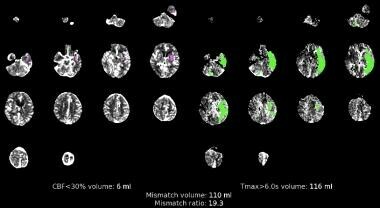 CT perfusion scan. Matched image sets with irreversible injury shown in magenta on the left and at-risk tissue (penumbra) shown in green on the right. Transcranial Doppler (TCD) ultrasonography measures cerebral blood flow in major cerebral arteries. Low preoperative distal carotid artery pressure (< 40 mm Hg) and an increased peak blood flow velocity have been found to be predictive of postoperative hyperperfusion. [16, 17] Therefore, TCD can be used to select patients for aggressive postprocedure observation and management. In a patient who is determined to be at risk, TCD can also be used during the postoperative period to assess for hyperperfusion. Cerebrovascular reactivity (CVR) to carbon dioxide can be used to test cerebral hemodynamic reserve. Normally, administration of acetazolamide (a carbonic anhydrase inhibitor that causes a local increase in carbon dioxide) induces a rapid increase in CBF. This iatrogenic CBF surge is measured using single-photon emission computed tomography (SPECT) scanning. The most important factor in preventing reperfusion syndrome is early identification and control of hypertension. [4, 5, 6] This is important even in normotensive patients, since delayed hypertension can occur. The use of TCD ultrasonography preoperatively and postoperatively can aid in identifying patients with increased CBF and, consequently, increased risk of hyperperfusion. [3, 34] Blood pressure should then be controlled aggressively if CBF elevates. In the situation of reperfusion after carotid endarterectomy (CEA), Cleveland Clinic has implemented an effective protocol for identifying risk factors of reperfusion syndrome and post-op hemorrhage. These risk factors include stenosis of >80%, pre-morbid hypertension, and poor collaterals. In these patients the BP was maintained at less than 120/80 post-op. Of 225 patients, 33% (n=75), 0 patients had post-op reperfusion syndrome, or hemorrhage. Prior to the protocol implementation they had a 17% complication rate. Unfortunately, no specific parameters or guidelines have yet been established for optimal blood pressure under these circumstances. According to the American Stroke Association stroke and intracerebral hemorrhage guidelines, the blood pressure goal for an acute intracerebral hemorrhage is a mean arterial pressure (MAP) of less than 110 mm Hg. [36, 37] This modest pressure goal can also be applied in acute ischemic stroke with reperfusion issues, because it does not hypoperfuse the tenuous surrounding tissues, nor does it further aggravate injury or hemorrhagic conversion. In any case, it remains the consensus that patients should be observed postoperatively in an intensive care unit (ICU) setting. If blood pressure management is an issue, it should be managed in the ICU until stabilized. Animal studies using various methods of modulating the cytokine response have shown beneficial effects from modulation of IL-1 and TNF. Various experimental studies using agents that block leukocyte endothelial adhesion (ie, monoclonal antibodies that block either the adhesion receptor on leukocytes [CD-18] or the corresponding adhesion receptor on the endothelial cell [ICAM-1]) have shown beneficial effects in terms of reducing infarct size and improving functional outcome. The adhesion process and the mechanism behind antiadhesion therapy are illustrated in the image below. A. Schematic representation of the process of endothelial-dependent leukocyte adhesion. Endothelial cells activated by histamine or thrombin rapidly translocate P-selectin to their surfaces (also E-selectin, not shown), tethering leukocytes to the endothelial cell. This tethering does not require an active response from the leukocyte. Once tethered, other factors, including platelet-activating factor and cytokines, are released to stimulate a leukocyte activation response. This response includes shape-changing and increased surface expression of CD-11/CD-18. CD-11/CD-18 then binds to the corresponding intercellular adhesion molecule 1 (ICAM-1) receptor on the endothelial cell, leading to firm endothelial attachment. This attachment may produce direct obstruction of the microcirculation or lead to infiltration into the surrounding brain parenchyma. B. Schematic representation showing that through the use of monoclonal antibodies directed against the ICAM-1 receptor, the CD-11/CD-18 to ICAM-1 attachment is prevented. This, in turn, prevents subsequent microvascular obstruction and leukocyte infiltration. Other molecules that have been tested and found to be successful in neuroprotection in mice or rats but not humans include, a-lipoic acid,  magnolol,  and Punicalagin. Another finding that might explain the difficulty of translating from murine to human is that during times of sublethal stress thousands of genes may be silenced in a process called preconditioning. 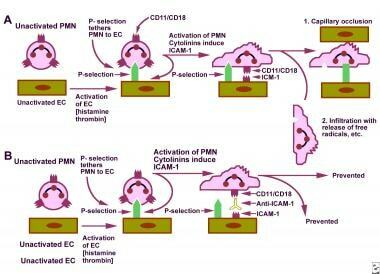 The preconditioning sets up multiple neuroprotective pathways and results in attenuation of the subsequent ischemic insult. Therefore, rather than a single molecule for neuroprotection, we will likely need a multimodal cocktail of molecules to save patients from pending ischemia and neuronal death. Natalizumab, a monoclonal antibody against an adhesion molecule on white blood cells that inhibits their movement across the blood-brain barrier, already proven to be an effective treatment in multiple sclerosis, completed a phase 2 trial in patients with acute ischemic stroke. Though no effect on reducing the increase in irreversible tissue injury typically following the acute phase of an ischemic stroke was demonstrated, there was some possible benefit to function outcomes in patients who received treatment. A larger study using natalizumab in acute stroke is currently in progress. In general, these experimental studies have shown benefit when a period of ischemia is followed by a return of blood flow (reperfusion), but not when ischemia is permanent. For this reason, antiadhesion therapies may prove to be most beneficial clinically when given in association with thrombolytic agents or thrombectomy. Although clinical studies using antibodies against ICAM-1 have failed to show a clinical benefit, further investigations of antiadhesion therapies in combination with t-PA and thrombectomy are ongoing. Given the strong preclinical evidence for the usefulness of anti–reperfusion injury agents, such agents are likely to be used in future "stroke cocktail" therapeutic efforts. Researchers assessed the use of stem cell product MultiStem in adults with ischemic stroke. Patients who received MultiStem within 36 hours of symptom onset demonstrated better global outcomes than those who received placebo. It is thought that some of the benefits seen in this trial might be related to a decrease in the cell-mediated production of inflammatory mediators that typically follows acute ischemic strokes. A phase III trial using the MultiStem cell product in acute stroke is set to begin enrolling the summer of 2018. Sundt TM Jr, Sharbrough FW, Piepgras DG, Kearns TP, Messick JM Jr, O'Fallon WM. Correlation of cerebral blood flow and electroencephalographic changes during carotid endarterectomy: with results of surgery and hemodynamics of cerebral ischemia. Mayo Clin Proc. 1981 Sep. 56(9):533-43. [Medline]. Karapanayiotides T, Meuli R, Devuyst G, Piechowski-Jozwiak B, Dewarrat A, Ruchat P, et al. Postcarotid endarterectomy hyperperfusion or reperfusion syndrome. Stroke. 2005 Jan. 36(1):21-6. [Medline]. Yoshimoto T, Shirasaka T, Yoshizumi T, Fujimoto S, Kaneko S, Kashiwaba T. Evaluation of carotid distal pressure for prevention of hyperperfusion after carotid endarterectomy. Surg Neurol. 2005 Jun. 63(6):554-7; discussion 557-8. [Medline]. Piepgras DG, Morgan MK, Sundt TM Jr, Yanagihara T, Mussman LM. Intracerebral hemorrhage after carotid endarterectomy. J Neurosurg. 1988 Apr. 68(4):532-6. [Medline]. Abou-Chebl A, Yadav JS, Reginelli JP, Bajzer C, Bhatt D, Krieger DW. Intracranial hemorrhage and hyperperfusion syndrome following carotid artery stenting: risk factors, prevention, and treatment. J Am Coll Cardiol. 2004 May 5. 43(9):1596-601. [Medline]. Wagner WH, Cossman DV, Farber A, Levin PM, Cohen JL. Hyperperfusion syndrome after carotid endarterectomy. Ann Vasc Surg. 2005 Jul. 19(4):479-86. [Medline]. Coutts SB, Hill MD, Hu WY. Hyperperfusion syndrome: toward a stricter definition. Neurosurgery. 2003 Nov. 53(5):1053-58; discussion 1058-60. [Medline]. Tehindrazanarivelo AD, Lutz G, PetitJean C, Bousser MG. Headache following carotid endarterectomy: a prospective study. Cephalalgia. 1992 Dec. 12(6):380-2. [Medline]. Liebeskind DS. Imaging the future of stroke: I. Ischemia. Ann Neurol. 2009 Nov. 66(5):574-90. [Medline]. Adhiyaman V, Alexander S. Cerebral hyperperfusion syndrome following carotid endarterectomy. QJM. 2007 Apr. 100(4):239-44. [Medline]. McCabe DJ, Brown MM, Clifton A. Fatal cerebral reperfusion hemorrhage after carotid stenting. Stroke. 1999 Nov. 30(11):2483-6. [Medline]. Caulfield AF, Wijman CAC. Critical Care of Acute Ischemic Stroke. Crit Care Clin. 2007. 22:581-606. Warach S, Latour LL. Evidence of reperfusion injury, exacerbated by thrombolytic therapy, in human focal brain ischemia using a novel imaging marker of early blood-brain barrier disruption. Stroke. 2004 Nov. 35(11 Suppl 1):2659-61. [Medline]. Strandgaard S, Paulson OB. Stroke. Cerebral autoregulation. 1984. 15:413-16. Sekhon LH, Morgan MK, Spence I. Normal perfusion pressure breakthrough: the role of capillaries. J Neurosurg. 1997 Mar. 86(3):519-24. [Medline]. Hosoda K, Kawaguchi T, Shibata Y, Kamei M, Kidoguchi K, Koyama J, et al. Cerebral vasoreactivity and internal carotid artery flow help to identify patients at risk for hyperperfusion after carotid endarterectomy. Stroke. 2001 Jul. 32(7):1567-73. [Medline]. Ogasawara K, Inoue T, Kobayashi M, Endo H, Fukuda T, Ogawa A. Pretreatment with the free radical scavenger edaravone prevents cerebral hyperperfusion after carotid endarterectomy. Neurosurgery. 2004 Nov. 55(5):1060-7. [Medline]. Khatri P, Wechsler LR, Broderick JP. Intracranial hemorrhage associated with revascularization therapies. Stroke. 2007 Feb. 38(2):431-40. [Medline]. Abciximab Emergent Stroke Treatment Trial (AbESTT) Investigators. Emergency administration of abciximab for treatment of patients with acute ischemic stroke: results of a randomized phase 2 trial. Stroke. 2005 Apr. 36(4):880-90. [Medline]. Larrue V, von Kummer R R, Müller A, Bluhmki E. Risk factors for severe hemorrhagic transformation in ischemic stroke patients treated with recombinant tissue plasminogen activator: a secondary analysis of the European-Australasian Acute Stroke Study (ECASS II). Stroke. 2001 Feb. 32(2):438-41. [Medline]. Intracerebral hemorrhage after intravenous t-PA therapy for ischemic stroke. The NINDS t-PA Stroke Study Group. Stroke. 1997 Nov. 28(11):2109-18. [Medline]. Hacke W, Kaste M, Fieschi C, von Kummer R, Davalos A, Meier D, et al. Randomised double-blind placebo-controlled trial of thrombolytic therapy with intravenous alteplase in acute ischaemic stroke (ECASS II). Second European-Australasian Acute Stroke Study Investigators. Lancet. 1998 Oct 17. 352(9136):1245-51. [Medline]. Nogueira RG, Lutsep HL, Gupta R, Jovin TG, Albers GW, Walker GA, et al. Trevo versus Merci retrievers for thrombectomy revascularisation of large vessel occlusions in acute ischaemic stroke (TREVO 2): a randomised trial. Lancet. 2012 Oct 6. 380(9849):1231-40. [Medline]. [Full Text]. Saver JL, Jahan R, Levy EI, Jovin TG, Baxter B, Nogueira RG, et al. Solitaire flow restoration device versus the Merci Retriever in patients with acute ischaemic stroke (SWIFT): a randomised, parallel-group, non-inferiority trial. Lancet. 2012 Oct 6. 380(9849):1241-9. [Medline]. Berkhemer OA, Fransen PS, et al. A randomized trial of intraarterial treatment for acute ischemic stroke. N Engl J Med. 2015 Jan 1. 372 (1):11-20. [Medline]. Goyal M, Demchuk AM, et al. Randomized assessment of rapid endovascular treatment of ischemic stroke. N Engl J Med. 2015 Mar 12. 372 (11):1019-30. [Medline]. Campbell BC, Mitchell PJ, et al. Endovascular therapy for ischemic stroke with perfusion-imaging selection. N Engl J Med. 2015 Mar 12. 372 (11):1009-18. [Medline]. Saver JL, Goyal M, et al. Stent-retriever thrombectomy after intravenous t-PA vs. t-PA alone in stroke. N Engl J Med. 2015 Jun 11. 372 (24):2285-95. [Medline]. Jovin TG, Chamorro A, et al. Thrombectomy within 8 hours after symptom onset in ischemic stroke. N Engl J Med. 2015 Jun 11. 372 (24):2296-306. [Medline]. Bracard S, Ducrocq X, et al. Mechanical thrombectomy after intravenous alteplase versus alteplase alone after stroke (THRACE): a randomised controlled trial. Lancet Neurol. 2016 Oct. 15 (11):1138-47. [Medline]. Goyal N, Tsivgoulis G, et al. Blood pressure levels post mechanical thrombectomy and outcomes in large vessel occlusion strokes. Neurology. 2017 Aug 8. 89 (6):540-547. [Medline]. Mistry EA, Mistry AM, et al. Systolic Blood Pressure Within 24 Hours After Thrombectomy for Acute Ischemic Stroke Correlates With Outcome. J Am Heart Assoc. 2017 May 18. 6 (5):[Medline]. Cikrit DF, Burt RW, Dalsing MC, Lalka SG, Sawchuk AP, Waymire B, et al. Acetazolamide enhanced single photon emission computed tomography (SPECT) evaluation of cerebral perfusion before and after carotid endarterectomy. J Vasc Surg. 1992 May. 15(5):747-53; discussion 753-4. [Medline]. Jansen C, Sprengers AM, Moll FL, Vermeulen FE, Hamerlijnck RP, van Gijn J, et al. Prediction of intracerebral haemorrhage after carotid endarterectomy by clinical criteria and intraoperative transcranial Doppler monitoring: results of 233 operations. Eur J Vasc Surg. 1994 Mar. 8(2):220-5. [Medline]. Naylor AR, Evans J, Thompson MM, London NJ, Abbott RJ, Cherryman G, et al. Seizures after carotid endarterectomy: hyperperfusion, dysautoregulation or hypertensive encephalopathy?. Eur J Vasc Endovasc Surg. 2003 Jul. 26(1):39-44. [Medline]. [Guideline] Adams HP Jr, del Zoppo G, Alberts MJ, Bhatt DL, Brass L, Furlan A, et al. Guidelines for the early management of adults with ischemic stroke: a guideline from the American Heart Association/American Stroke Association Stroke Council, Clinical Cardiology Council, Cardiovascular Radiology and Intervention Council, and the Atherosclerotic Peripheral Vascular Disease and Quality of Care Outcomes in Research Interdisciplinary Working Groups: the American Academy of Neurology affirms the value of this guideline as an educational tool for neurologists. Stroke. 2007 May. 38(5):1655-711. [Medline]. Kapur NK, Paruchuri V, Urbano-Moral JA, Mackey EE, Daly G, Qiao X, et al. Mechanically Unloading the Left Ventricle Before Coronary Reperfusion Reduces Left Ventricular Wall Stress and Myocardial Infarct Size. Circulation. 2013 Jun 13. [Medline]. Deng H, Zuo X, Zhang J, Liu X, Liu L, Xu Q, et al. a-lipoic acid protects against cerebral ischemia/reperfusion-induced injury in rats. Mol Med Rep. 2015 Jan 9. [Medline]. Li H, Liu X, Zhu Y, Liu Y, Wang Y. Magnolol derivative 002C-3 protects brain against ischemia-reperfusion injury via inhibiting apoptosis and autophagy. Neurosci Lett. 2015 Jan 6. 588C:178-183. [Medline]. Yaidikar L, Thakur S. Punicalagin attenuated cerebral ischemia-reperfusion insult via inhibition of proinflammatory cytokines, up-regulation of Bcl-2, down-regulation of Bax, and caspase-3. Mol Cell Biochem. 2015 Jan 3. [Medline]. Simon R. Post-conditioning and reperfusion injury in the treatment of stroke. Dose Response. 2014 Dec. 12(4):590-9. [Medline]. [Full Text]. Elkins J, Veltkamp R, et al. Safety and efficacy of natalizumab in patients with acute ischaemic stroke (ACTION): a randomised, placebo-controlled, double-blind phase 2 trial. Lancet Neurol. 2017 Mar. 16 (3):217-226. [Medline]. David C Hess, Alexander P Auchus, Ken Uchino, Cathy Sila, Wayne M Clark, David Chiu, et al. Abstract 71: Final Results of the B01-02 Phase 2 Trial Testing the Safety and Efficacy of MultiStem® in Treatment of Ischemic Stroke. Stroke. Feb 2016. Vol 47:Issue Suppl 1. Wayne M Clark, Thomas G Devlin, Dileep R Yavagal, Souvik Sen, Richard A Bernstein, Lawrence R Wechsler, et al. Abstract 177: Exploratory Results From the B01-02 Trial: Administration of MultiStem® Results in Decreased Circulating CD3+ Cells and Lower Levels of Inflammatory Cytokines. Stroke. Feb 2016. Vol 47:Issue Suppl 1. Bath PM, Lindenstrom E, Boysen G, De Deyn P, Friis P, Leys D, et al. Tinzaparin in acute ischaemic stroke (TAIST): a randomised aspirin-controlled trial. Lancet. 2001 Sep 1. 358(9283):702-10. [Medline]. The International Stroke Trial (IST): a randomised trial of aspirin, subcutaneous heparin, both, or neither among 19435 patients with acute ischaemic stroke. International Stroke Trial Collaborative Group. Lancet. 1997 May 31. 349(9065):1569-81. [Medline]. The Publications Committee for the Trial of ORG 10172 in Acute Stroke Treatment (TOAST) Investigators. JAMA. Low molecular weight heparinoid, ORG 10172 (danaparoid), and outcome after acute ischemic stroke: a randomized controlled trial. Apr 22-29 1998. 279(16):1265-72.